I love EPSON printers. If you are a follower of my blog, this news comes as no surprise to you. :) Other brands have been used by my family, but when it comes down to it, EPSON is our favorite. Simply, I have never experienced picture quality as amazing as EPSON's in any other brand. Another fact about me you would know if you are a reader of my blog is that one of my favorite hobbies is scrapbooking. I began paper scrapbooking 13 years ago. I was a freelance artist for Memory Makers Magazine before they called it quits, and have been published in a score of other magazines and idea books throughout the years. Most of those layouts or mini books that made their way to print were created traditionally- that is, with paper products and other tangible elements. Unfortunately, I was injured almost two years ago. The result of the injury after two surgeries is that I still have a tear in the cartilage in my wrist that will never be able to be repaired due to the type of tear and where it is located. Therefore, I cannot use my right hand to do simple tasks that most of us take for granted- writing, using scissors, lifting items heaver than a full coffee mug, etc. So, I cannot paper scrapbook anymore. Not willing to give my hobby up entirely, with the help of some excellent tutorials and online classes, I learned how to scrapbook digitally. To tell you I am hooked is an understatement. I am head over heels in love with my computer now. :) Up until recently though, I was a little frustrated because all of my digital layouts were stored in the computer or on external hard drives because I had no way of getting them into a physical scrapbook. When I was contacted about testing an Epson Stylus Photo R1900 Ink Jet Printer, I about freaked out in excitement!! I was thinking, NO WAY!!! This is THE BEST review EVER! :) This printer i a digital scrapbooker's dream! The Epson R1900 sets a new standard in glossy printing. This powerful, wide-format printer offers incredible versatility so you can explore all your creative aspirations. 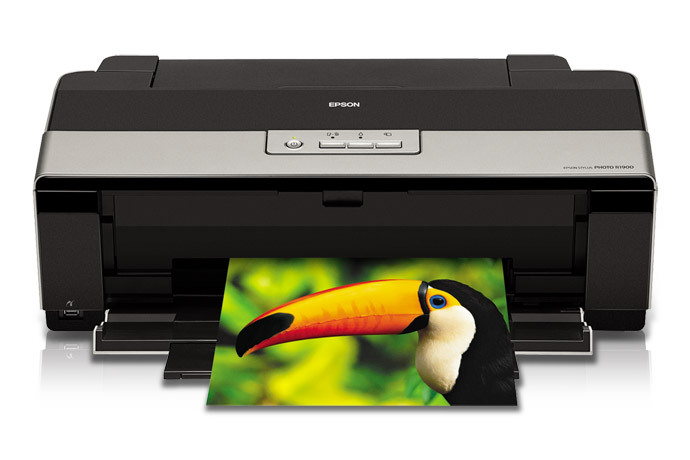 With Epson UltraChrome Hi-Gloss 2 pigment ink, the R1900 delivers vibrant photos up to 13 inches wide and up to 44 inches long. Offering the highest level of media versatility of any printer in its class, this remarkable performer prints on a wide variety of media types including glossy, luster, matte, canvas and fine art papers. The minute I got home and saw the enormous box from EPSON, I was excited! I cleared my scrappy desk and set up the printer. Set-up was quite simple and was finished quickly. Once I got the software loaded onto my laptop, I printed one of my favorite layouts. The print quality of my layout is perfect. The colors are crisp and vibrant. Honestly, the layout almost doesn't look digital. The ink was dry to the touch almost immediately, Even so, I waited an hour before I slipped it into a page protector. No smearing at all. The next project we tackled was a newspaper for my son's school project. He used Microsoft Power Point to create a large format document, and was able to use the printer himself to print the resulting product. He said it was as simple as using his regular printer, but cooler because it was able to print a document that was 13 inches x 19 inches. 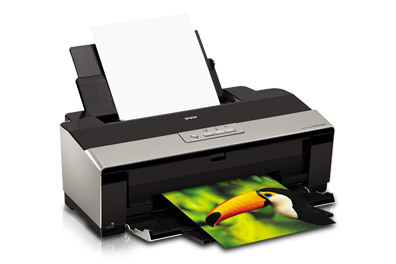 He is looking forward to creating more posters and printing them with the Epson Stylus Photo R1900 Ink Jet Printer. Speaking of posters, hubby has used the printer many time since we got it to print band posters. He is impressed with the picture quality, but is more impressed with how he can print in larger formats than he can with our home printer. I am beyond pleased with the Epson Stylus Photo R1900 Ink Jet Printer. I would recommend this printer to anyone who is a digital scrapbooker, someone who wants to print larger photographs, or for anyone in need of a large format printer or posters and such. The only drawback I have had with this printer is that it does go through the ink fairly quickly. Even so, having amazing frame-worthy large photos and scrapbook pages is worth it to me! EPSON typically sells the Epson Stylus Photo R1900 Ink Jet Printer for $549.99, but right now, you can pick it up for $399.99 with free shipping. For getting a superb quality printing and endless printing with first class quality,there is only one option and it is epson printer with original Epson Printer Cartridge.